Here’s a recent post at Fantasy Book Cafe: Old Houses and New Beginnings by Yangsze Choo. I don’t know, maybe this doesn’t sound like a slow-motion tragedy after all. Actually, it sounds like a Gothic, where we expect all the haunting parts to lead to a satisfying outcome for the protagonist. Has anyone read this? I think I actually have it on my TBR pile, but should I shuffle it more toward the top? I’m planning a research trip to Dalian, a city in the part of northern China previously known as Manchuria. “What will you do there?” asked a friend. I had to reply that I wasn’t quite sure, but my main purpose was to wander around and look at old buildings from the early 1900s. … Old houses hint at stories and secrets; their rooms capture the fleeting impressions of feet that have worn down wooden stairs and hands that have polished banisters. When I wrote my first book, The Ghost Bride, I was inspired by a Chinese house in Penang, Malaysia, that had fallen into disrepair. Built by a wealthy Chinese merchant to house his extended family and consisting of courtyards and rooms upon rooms, it was like a tightly constrained world. I could almost feel the weight of family obligation—very helpful when writing the tale of a young woman who is asked to marry a dead man! The decay of the house also suggested the parts of the book which take place in the Chinese world of the dead. My second novel, The Night Tiger, is about an eleven-year-old Chinese houseboy who suspects that his master is actually a man-eating tiger. Wow. My first impulse is to grab the book and my second is to back away from it slowly. My third (which I will follow when the book comes out) is to look it up on Goodreads and read some reviews. These do sound very much like Chinese Gothics, if there is such a category. I can really get into a creepy, haunted, atmospheric Gothic story … if it is not also a grim story where the protagonist slowly descends into inescapable tragedy. It sounds a bit like Singapore 3. It’s been a few years, but I remember reading and enjoying The Ghost Bride. I don’t remember details, but I retain a satisfaction for it which would probably be absent if it had been a tragedy. Ahhhh no, this isn’t a depressing/too-Gothic book at all! I promise! I love this book. Have you watched the Miyazaki film, Spirited Away? Because the concept and general feel is similar. 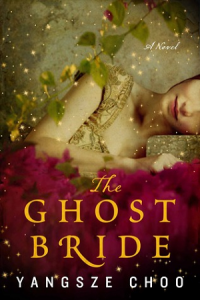 I know that isn’t too descriptive, but if you’ve seen that movie and liked it, then you’ll pick up on–and enjoy–the unique atmosphere of The Ghost Bride. It DOES move slowly in the beginning, but on my 2nd read (which was much slower and more focused), I saw how that helps the reader understand the heroine before she enters the spirit world and everything, well, crazy happens. Once THAT happens (about 6 or so chapters in, if I remember correctly? ), then the pace really picks up. And actually, this is probably in my “top favourite endings” category, because it’s one of the most hopeful twists on the whole “which world should I pick?” trope that occurs in lots of fantasy books. I usually hate what the characters decide on that issue, but (no spoilers!) I did love how the author resolves it. I hope you give it a try! Thanks for posting her interview by the way–I’ve been waiting for news about her next book. So excited! Oh, well, it sounds like I should definitely read this one! A slow beginning is normally some thing I actively enjoy, so no problem with that. All right, it’s now near the top of my TBR pile, and thank you for your feedback. I love The Ghost Bride–it does a really beautiful job of crafting world and characters, and despite the eerie unsettling nature of Li Lan’s journey in the ghost world, there’s generosity and hope and joy. Also agreed with Katie on really liking the ending, which was very satisfyingly resolved. I’ve reread several times and always find myself sinking in and enjoying every page. Good, good, it’s right up at the top of my TBR pile now.